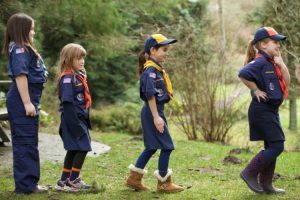 Spring Sale – Earn Your Way To Camp! With spring in the air, it’s time to clean up Norseland Scout Camp. Cobwebs need to go, cupboards need organizing, refrigerators washed out, windows washed, maintenance outdoors, trees need to come to make firewood and the list goes on! The Norseland Scout Camp Committee is asking for your help. 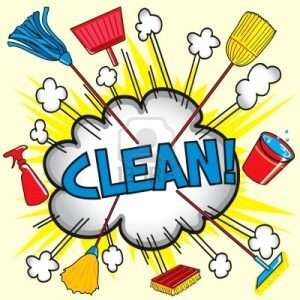 On Saturday, April 27, 2019, there will be a Norseland Clean Up Day beginning at 8 a.m. The committee is asking for ADULT help from every unit. Stay all day or help for a few hours; either way it will be much appreciated. 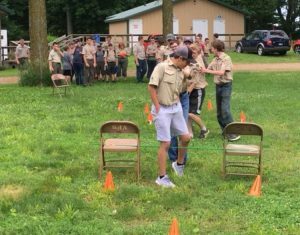 Each week over 2,000 Scouts across 15 counties in south central Minnesota stand up and say “On my honor I will do my best, to do my duty, to God and my country”. This is the opening to the Scout Oath. A code that is the basis for all we do in Scouting. 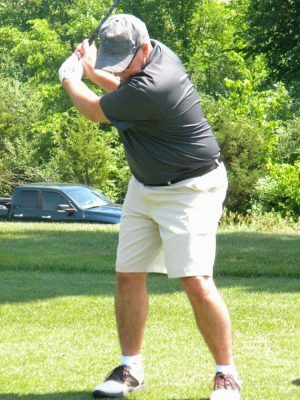 The ProGrowth Bank On My Honor Sporting Clays Classic supports the Twin Valley Council and the programs and services provided to the 105 units served by the council. 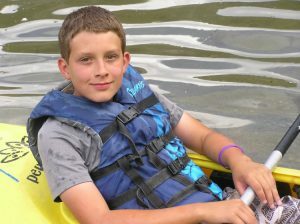 Specifically, the programs at our three camps: Cuyuna, Norseland and Cedar Point. 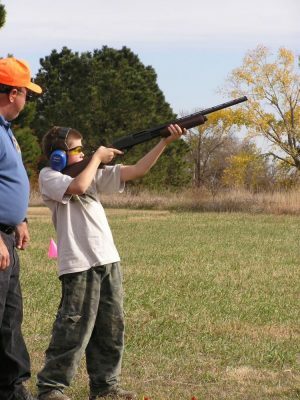 Please join us on Thursday, May 2, 2019, at Caribou Gun Club in LeSueur, MN to support Scouting and enjoy this 100 clay shoot! This full day event is filled with the clay shoot, optional flurry rounds, long shot rounds, silent auction, raffles, amazing food and fellowship. 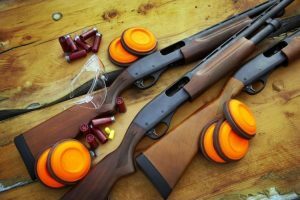 5:30 p.m. with optional steak dinner at 4 p.m.
Progrowth Bank and Twin Valley Council are proud to announce the addition of a Youth/Adult Team Shoot as part of the “On My Honor Sporting Clays Classic”. 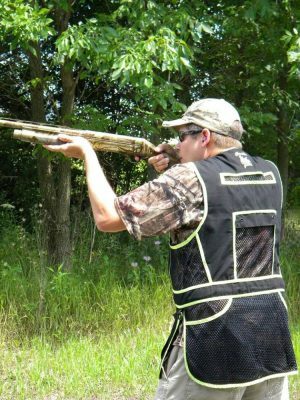 New for 2019, youth/adult teams are invited to a 50-bird tournament at the Caribou Gun Club in LeSueur. The event begins at 5:30 p.m. Participants should bring their own gun and ammunition. There will be 20 gauge shotguns available to borrow upon request (limited quantity). Youth/Adult teams are also welcome to join us for a steak dinner and silent auction beginning at 4 p.m. Cost for the dinner is $20 per person. Space is limited to 40 teams so please register early! It is our pleasure to announce the Mid-Iowa Council 2019 Railroad Camporee! The Mid-Iowa Council would like to invite the Twin Valley Council Scouts BSA to join us for this great event. May of 2019 will be the 150 Anniversary of the Golden Spike and the Transcontinental Railroad and this opportunity provides for our Scouts to learn about the Railroad industry, careers, and hobbies it encompasses. See the attached PDF Letter and Flyer for more information for the units in the Twin Valley Council. 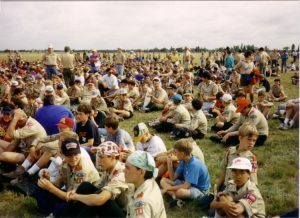 This is a true opportunity for Scout units to experience a Jamboree type event with an expected 1500 Scouts, Leaders, and Staff in camp for the weekend. If you would like to visit this event please contact me and we will work on making it available to you as a guest. Any questions, comments, and suggestions can be sent to wtdistrictcommissioner@gmail.com. Join us on Saturday, May 4, 2019, from 8 a.m. – 5 p.m. for a half day merit badge session and a half day clean up session. The weather will dictate which will come first; merit badges or clean up. 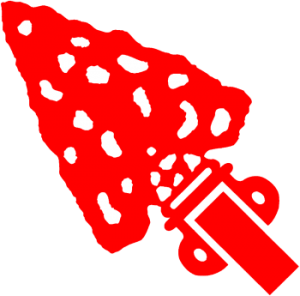 Merit Badges – $10 per Scout; class size limited to 30 Scouts per merit badge. Scouts will participate in the Norseland clean up project opposite the time they are in merit badge classes. Forestry – is full. Do not register for this class. Composite Materials – is full. Do not register for this class. Citizenship in the Nation – is full. Do not register for this class. JUST ADDED! Crime Prevention – this course will be let by the local Sheriff’s Department. This merit badge will give Scouts a opportunity to learn how to avoid becoming a victim of a crime, different types of crime and the law enforcement system. JUST ADDED! First Aid – Taught by Brad Zinniel. Brad is a 25+ year paramedic who has been on the local Swat team as well as the National board that sets the medical standards. JUST ADDED! 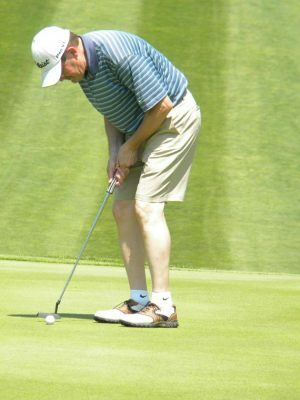 Plumbing – Taught by Eddie Erickson. Eddie is a master plumber and owner of Erickson Plumbing. While Scouts are working on merit badges, adults will spend the day cleaning up Norseland. The lodges needs cleaning, brush needs to be cut, firewood cut, bushes trimmed, etc. Please bring gardening/landscaping tools such as loppers, small pruners, rakes, saws, shovels, wheel barrows, and anything else that may come in handy. Scouts will also be participating in clean up opposite their merit badge time. Any troop assisting with clean up is welcome to camp at Norseland for the weekend at no additional charge. Food and leadership is the responsibility of the troop. Sites are first come first served. On Saturday night, beginning at dark, will be the council-wide Order of the Arrow call-out. Details for this event will be announced later. Many hands make light work – so let’s have many hands at Norseland May 4th! For more details or for questions, please contact Alex Hutchens. Scout, Venturers and Leaders! 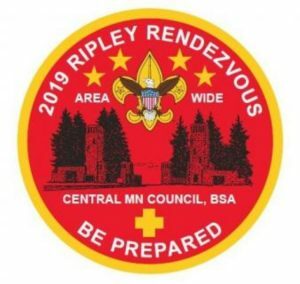 Don’t miss the 2019 Ripley Rendezvous. Choose from 3 great programs for only $50 per person! This event is presented by Central Minnesota Council and Camp Ripley. Special Attractions & Events include Military Dignitaries, MN Military Museum, Saturday Night Lightshow, Saturday Night Stage Show, and High Adventure Booths. Trading Post and Canteen filled with camping supplies, a National Scout Shop plus souvenirs, food and snacks. Program space is limited for this event so please register early! 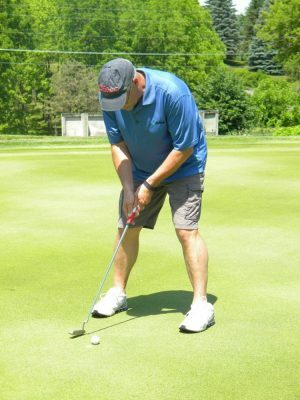 After the April 1, 2019, date the fee is $60 per person. This is the perfect opportunity for adult leaders to become trained adult leaders. And it can be done in one weekend! 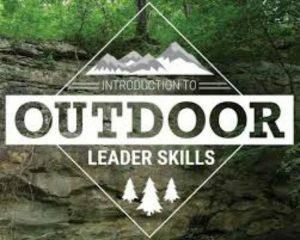 Friday, June 7th, you will arrive at Norseland Scout Camp at 3 p.m., pitch your tent and “Be Prepared” for a weekend of training sessions that are fun! When you leave on Sunday, June 9th around 2 p.m., you leave with new found confidence, knowledge and skills. Cost for the weekend is $45 if registered by May 24, 2019. After that date you may still attend but must register through Shawn Pomeroy. Staff will pay $10 to cover the cost of food. Included in the fee are all program materials, meals, trained patch and T-shirt. Please indicate shirt size when registering. Also, please list you Scouting positions during sign up. Each participant should bring their own tent, camping gear, person items, field uniform and activity uniform. 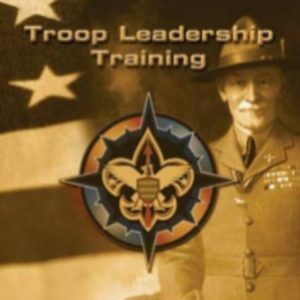 The purpose of the Introduction to Leadership Skills for Troops course is to teach Scouts with leadership positions about their new roles and to most effectively reach success in that role. 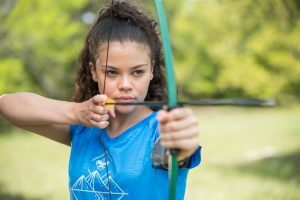 It is intended to help Scouts BSA in leadership positions within their troop, understand their responsibilities and to equip them with organizational and leadership skills to fulfill those responsibilities. Each Scout should “Be Prepared” to camp. Please bring your camping gear, tent, field uniform & activity uniforms and personal gear. Check in on Friday, June 7th begins at 3 p.m. and you will on your way home Sunday, June 9th by 2 p.m. 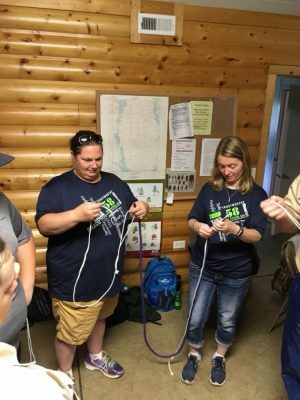 This is a three day training session held Friday, June 7 – Sunday, June 9, 2019, at Norseland Scout Camp located near St. Peter. Cost to attend this training is $45 per person if registered by May 24, 2019. After that date you may still attend but must register through Shawn Pomeroy. Staff trainers will pay $10 to cover the cost of food. Included in your $45 fee are all training materials, meals, trained patch, and t-shirt (if registered by May 24, 2019). Please indicate shirt size when registering at www.twinvalleybsa.org. Mankato is excited to host the world famous United States Air Force Thunderbirds on Saturday, June 15, 2019 and Sunday, June 16, 2019 at the Mankato Regional Airport. 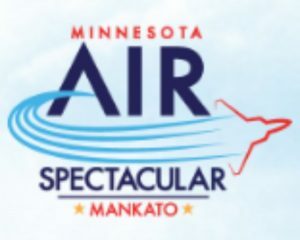 The 2019 Minnesota Air Spectacular is produced by the Verizon Center and City of Mankato. The volunteers for Minnesota Air Spectacular will be coordinated by representatives from Kiwanis Holiday Lights. They have asked Twin Valley Council to help with volunteers. The goal is to completely schedule all volunteers for the event by April 30, 2019. Volunteer categories include: Admissions, Chalets, Clean-up, Concessions, Guest Service, Parking, Set-up, Souvenirs, Take-down, VIP Admissions, and Volunteer Services. Volunteers are encouraged to wear the field uniform representing Twin Valley Council. A volunteer orientation and training meeting will be held on Wednesday, June 12, 2019, from 6-8 p.m. at the Verizon Wireless Center in Mankato. We ask that at least one volunteer from Twin Valley Council attends. Twin Valley Council’s Boy Scout Summer Camp nestled in the woods near Crosslake, MN. Cuyuna Scout Camp is located in scenic North Central Minnesota. The camp is on 680 acres north of Brainerd and just outside of Crosslake. There are 5 beautiful lakes that border on the camp and one, Russel Lake, is fully within camp boundaries. It is not unheard of to see eagles, and loons are a common occurrence. The camp has 13 developed campsites which are designed for a group to operate under the patrol method. The camp boasts a beautiful wooded area and is known for its birch and pine trees. 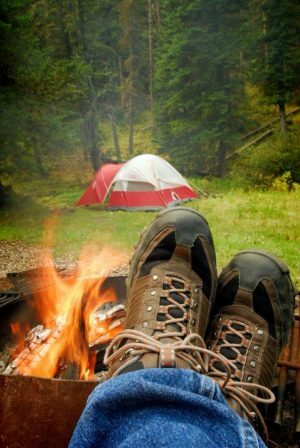 Camp Cuyuna is a Nationally Accredited resident camp operated by the Twin Valley Council, Boy Scouts of America. 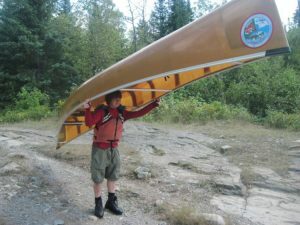 See below the Older Scout Boundary Waters Canoe Trip that happens the same week as your unit is at Cuyuna Summer Camp! 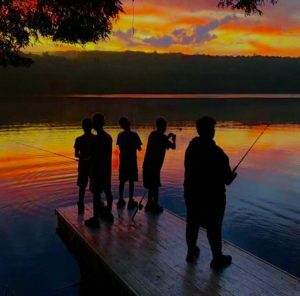 Twin Valley Council and Northern Tier High Adventure have teamed together to create an exciting opportunity for Scouts this summer in conjunction with your week at Camp Cuyuna. 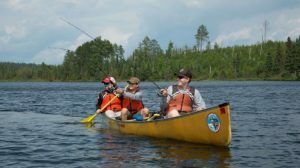 A 5-day Boundary Waters Trip! 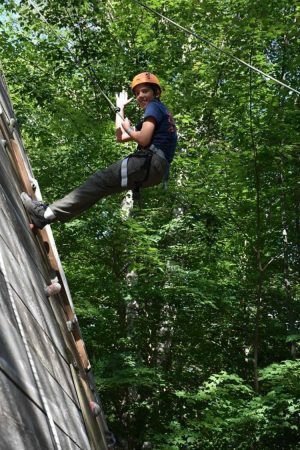 Each week there will be a trip to the Northern Tier High Adventure Base near Ely, MN. Scouts will travel to Camp Cuyuna with their troop on Sunday arriving by a designated time. 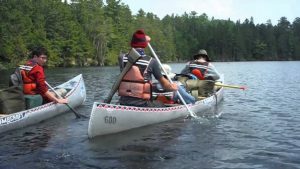 We will then transport those headed to Ely from Camp Cuyuna to the Northern Tier High Adventure Base where they’ll spend the next five days on a canoe trek in the Boundary Waters. 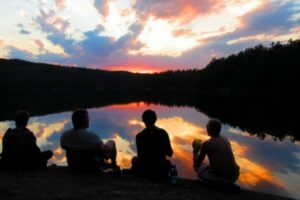 On Friday, all will arrive back at Northern Tier base camp and travel back to Camp Cuyuna in time for the closing campfire and to head back home with their troop on Saturday. Space is limited on this adventure. Each week a “crew” of 8 people will head out for their adventure. This will include 2 adult leaders. The crew of 8 will consist of youth and adults from all units at camp that particular week. In weeks when crew is not large enough or adult volunteers are not available, we will work with Northern Tier to pair our youth with another Council’s contingent. 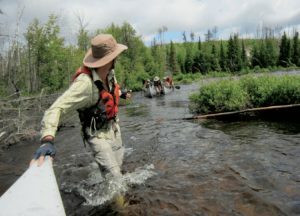 Adults – this is the perfect time to experience a short trek within the Boundary Waters with a seasoned ranger. 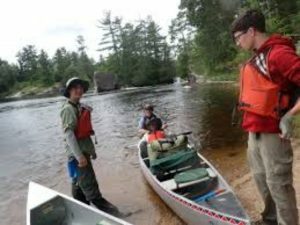 Experiencing the trek, the canoes, the equipment and gaining valuable knowledge first hand will aid in planning such a troop event. Don’t miss out on this opportunity! The cost of this trip is $475 with $100 deposit due at registration and $375 due by May 1, 2019. Please note, you will be registering through Northern Tier, not the Twin Valley Council site. Be a registered member in Scouts BSA or Venturing. Must be at least 14 years old OR have completed the 8th grade and be 13 years old by the time of arrival. Be classified as a “swimmer” prior to arrival. Must fall below the maximum (295 pound) allowed weight for participation and it is strongly recommended that no participant weigh less than 100 pounds. Registration is per individual and is open by using the link above. 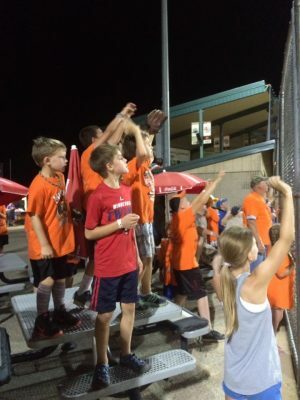 Scout Night With The MoonDogs has a new format for 2019! And we’re hoping to knock it out of the park with options that will work with your family! Enjoy your favorite tailgate foods together with other Scouting families before the game, starting at 5:30 p.m. At 7:05 p.m. the Mankato MoonDogs host the St. Cloud Rox for nine innings of great baseball fun! Wear your Scout Field Uniform and line up on the field with the team for the National Anthem – it will be a Kodak moment for sure! The enjoy the game and be sure to root for the home team. Immediately after the game, grab your tent and gear to camp out on the field! Enjoy a fun camping experience in a totally cool environment – the ball field; how many families can say they camp in a ball field! Breakfast is provided. Plan to stay Saturday for a fun Day Camp at Franklin Rogers Park beginning at 8 a.m. Join the Minnesota State University Mankato Athletes to practice your favorite sport, play games and learn what it takes to be a collegiate athlete – all while playing on the field at Franklin Rogers Park! Adults attend this camp free of charge. Please bring water, tennis shoes, your favorite baseball camp and sun screen. MoonDogs Day Camp is open to Cub Scouts and siblings grades K-5. Now the best part – you can pick and choose which of the three events work into your world. Just register for those events you will be attending! It’s just that simple – we’ll see you at the ballpark! Questions please call Liz Paul. The Popcorn Committee for Twin Valley Council is very excited to announce Popcorn Training Camp 2019! Popcorn training is new and improved and the committee is hoping you’ll find it a fun filled event! 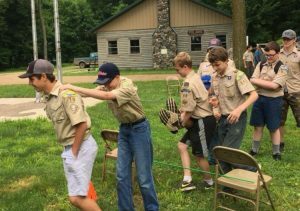 Popcorn Training Camp will held at Cedar Point Scout Camp located near Fairmont, MN, on Saturday, August 24, 2019, beginning at 9 a.m. The first 90 minutes of the day will be spent learning all about the NEW Trail’s End popcorn app, and the NEW Trail’s End prize program. We’ll talk popcorn sales tips and strategy and have time for conversations with fellow Popcorn Kernels and other adults. 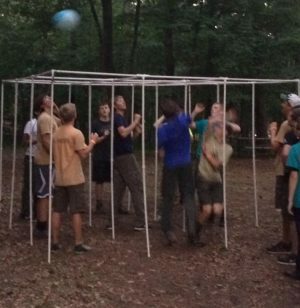 Following popcorn training we will open up Training Camp for the Scouts and have some fun! The archery range will be open for target practice. Bring your swimsuit and towels as the waterfront will be open for swimming and kayaking. There will yard games etc. as well. As we confirm activities we will list them here so be sure to check back! For lunch grab a stick and roast a hot dog or two. If you’d like a soda please bring one along otherwise, we’ll have water available. Training Camp wraps up at 2 p.m. At this time you are welcome to wander Cedar Point Scout Camp (at your own risk) or head into Fairmont for some shopping. In the evening it’s Scout Night At The Raceway! What Scout doesn’t want to sleep on the racetrack? This event is happening at the Fairmont Raceway. Your Scout will attend the races free of charge and adults will receive reduced priced tickets of $6 each. You do need to register for this event separately so please see the button below. Are you a $1,500 Club Member? All Club Members (those who sold $1,500 or more in popcorn during the 2018 sale) will receive an awesome $1,500 Club Sweatshirt sporting our new Club logo! However, you must register by July 12th AND attend the event to be eligible to receive the sweatshirt. 2019 Commission Climb. Unit who attend the Popcorn Training Camp with their Popcorn Kernel and at least one youth will have an additional 2% commission added to their base level. 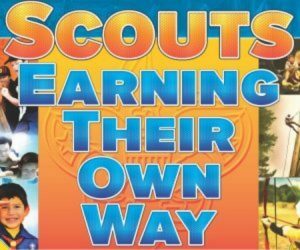 As an added bonus, units who have 10% of their youth who are on their BSA unit roster July 31, 2019, attend the Training Camp on August 24, 2019, along with the Unit Popcorn Kernel (minimum of 2 Scouts) will receive an additional 3% commission. For example, if your units has 25 Scouts on the roster July 31, 2019, your unit would need 3 Scouts (10% of 25 is 2.5 rounded up to 3) and the Popcorn Kernel. Another example, if your unit has 9 Scouts on the roster July 31, 2019, your unit would need 2 Scouts (10% of 9 is .9 rounded up to 1 but there is a 2 youth minimum requirement) and the Popcorn Kernel. 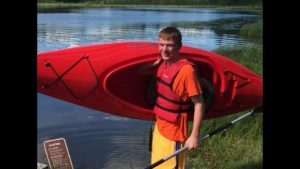 This mini high adventure happens during MEA Weekend at the Northern Tier High Adventure base in Ely, MN. For only $150 per person plus transportation, you will have a mini wilderness high adventure on the Boundary Waters Canoe Area! We will leave Mankato on October 17, 2019, and arrive at base camp in time for dinner. After spending the night in the cabins and a great breakfast, we hit the water the morning of the 18th and continue our adventure until arriving back at base camp on October 20th to turn in our gear, have lunch, then depart for home. The transportation arrangements to Northern Tier base camp, including methods of transportation and times, will be determined once we know who is interested in attending. 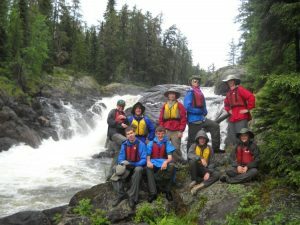 The $150 base price of this adventure includes food (9 meals), your canoe, safety gear, crew equipment and staff guide. There is an additional cost for transportation. Each participant is also responsible for their own personal gear. There will be an orientation on Saturday, August 24, 2019, beginning at 1 p.m. at Cedar Point Scout Camp. Registration is open until September 1, 2019. The 24th World Scout Jamboree will bring together Scouts from around the globe to experience new adventures, cultures, and friendships.